Sun Journal reporter Bonnie Washuk talks to the five students from Lewiston and Auburn high schools who are members of the Class of 2015. “I don’t think I could find a better balance anywhere else of everything: diversity, athletics, academics, fun, seriousness,” said Allaina Murphy ’15 of Poland Spring, who graduated from St. Dominic High School in Auburn. 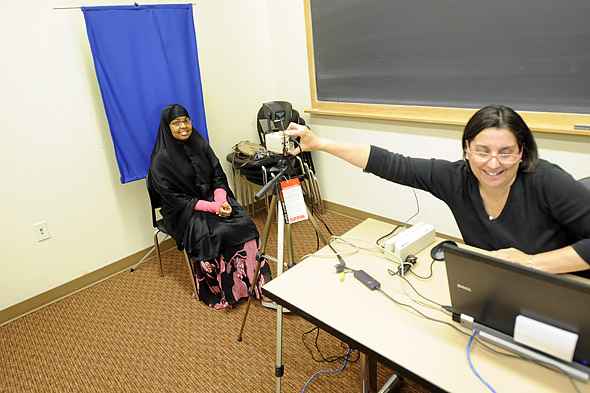 Among the five local freshmen are two Somali students, the first members of the local immigrant community to matriculate at Bates. That’s a point of pride, Lewiston mayor Larry Gilbert tells the Sun Journal. Their matriculation is “a first, and a plus.” View story from the Sun Journal, Sept. 6, 2011.